I have read MANY articles on kids health and nutrition over my almost 9 years of mom-hood. There are as many different opinions and techniques out there on nutrition for kids as there are for adults. It basically comes down to do what works for you. I have found what works for me. It may not work for you, or you may think I am the meanest mom I know…to each their own. With three young girls I usually end up with a love it, a hate it, and an indifferent when I make a new dish. I have made a few terrible dishes (I may not be the greatest cook; read Beyond the Dinner Table). I have read several books on how to hide veggies in your kids food . I even admit to following a couple of the recipes. Then I thought, “why am I doing this?” I want my kids to like and eat their fruits and veggies. Therefore they need to know they are eating them. I haven’t hidden the veggies since. Instead I give my kids the chance to try new foods. I take them to the grocery store with me. We like to see if there is anything new and we usually buy it. I live by the motto of try anything once. Last week we had a fruit that looked like a cantaloupe, but tasted like a lemon. The score was 1/1/1 as usual. For us it doesn’t have to be an entirely new food to try. Just cutting, cooking or seasoning differently can have a better result with kids. Mine like baby carrots with dip, but not regular carrots just peeled and cut up. I sliced myself some green pepper yesterday to have with some dip and Sass wanted to try it. She ate her one slice without complaint. I asked her if she liked it and she said, “no, but I didn’t want to waste it so I finished my piece”. Shush had a plate of it. She will try anything (not always eat it all, but try it) if is on her plate. I am lucky enough to live by my brother who has 3 little kids aged mine are in the same ages. I have found when “The Cousins” (yes, that’s what they call each other) eat something, it is worthy of a try from my own kids. I am all for peer pressure when used for the good of all dinner time. Explained it to a different one of my children a minute ago. I am tired of explaining. When we went to our last pediatrician check up, the doctor explained the 5, 4, skip 3, 2, 1 rule. It was the first time I had heard this. It was most interesting. 5 servings of fruits and veggies everyday. 4 servings of protein everyday. No more than 2 hours of screen time a day. 1 hour of exercise everyday. It seems to have helped to have the doctor explain or emphasize the importance of healthy nutrition. It has stuck in their heads. Even though Sass is sure the Doctor meant to say four deserts ev ery day. I like to state thing plainly, in a way for my kids to understand. When Sultana brings home an unopened water or juice box that I sent with her lunch I take the time, right then and there (while unpacking her lunch box so I can’t forget) to reminder of some serious digestive issues she suffered last year caused by not drinking anything during lunch. This real life example has convinced all three of my girls the importance of water! It is helpful to have someone else other than myself express interest in their nutritional needs. When we visit Grandma she makes sure to let the kids know they have to eat their healthy food before they will get their desserts. Think of the child’s nutritional needs as a daily requirements. I am the first to admit that breakfast is the hardest meal of the day to get my kids to eat. With that in mind we have made breakfast a laid back affair. The kids eat what they like (within reason). Sultana has cereal with milk. Sass has either a yogurt cup or a frozen Gogert and a banana. Shush has a cheese stick (string cheese) and half an apple. Snack is usually a fruit. Then lunch is half a sandwich, sugar pea pods and cheesy stick. Dinner is whatever we are all eating. I have been known to cater too much to my children in the dinner department (says my sister in law). When making spaghetti, I put the sauce on the side. The girls know that before they get more noodles they have to eat all their sauce and veggies. (Man! Can those kids pack away some noodles!) I find myself compelled to mention at this time that a child’s serving/ daily requirements are not the same as an adults. I recently got an article from Kraft with great ideas for picky eaters. I found a cookbook for kids by kids. One of the ideas was ham and cheese baked in a roll. We tried it with different cheeses and meats. I let the kids put their own selections together then I put them in the oven. The girls had fun, and enjoyed their end results. Kraft Healthy living kids recipes had some fun ideas for the little ones too. We are 4 weeks into the school year. I have stared a new routine with the girls; I make them pack their own lunches (they are almost 9 and almost 7). I am on-hand to help get things out of the pantry, and make sure they pack a fruit or veggie, not just the chips. They pack things I would never have thought of. Sultana likes to take cereal in her Thermos, and buy milk from the school. Sass likes to make her own wraps with tortillas, lettuce, cheese, and sour cream. They have the option of buying lunch from school, but they really don’t like most of the choices so rarely do so more than once a week. Don’t forget to label your lunchboxes and Tupperware, too! One of my greatest healthy eating successes came when I put a fruit bowl on the counter. My kids are now always asking if they can eat fruit! They see it and just like that don’t have to raid the pantry. It also helps me in a pinch. I can tell them to get a fruit if they are begging for a snack while I’m in the middle of something else. I am not lazy, I swear, it just seems like all they do is eat some days. I was having a conversation with S one day about having kids home all day in the summer and how they tend to graze all afternoon. They will stand there with the pantry or fridge open and just stare… then firing off ideas at me. “Can I have a hand full of chocolate chips? How about 3 packages of fruit snacks? How about some Nilla wafers?” They usually harass me into submission! S had a great idea. She suggested packing their lunch boxes like they were going to school, including snacks. Let them help with the choices and emphasize this is what is theirs from after breakfast until dinner. It saves whining, keeps some variety until they get down to the last few items, and they control when they eat what. More importantly, Mom can see exactly what they have eaten so for whatever variety of picky eater you have you can tailor dinner to fill in the gaps. Most pediatricians have the same nutritional requirements (check out the Mayo Clinic’s guidelines here). Of course, contact your pediatrician with specific questions as I am in no way an authority on allergies or special need diets. We’d love to hear what you have found that works so please share your comments. 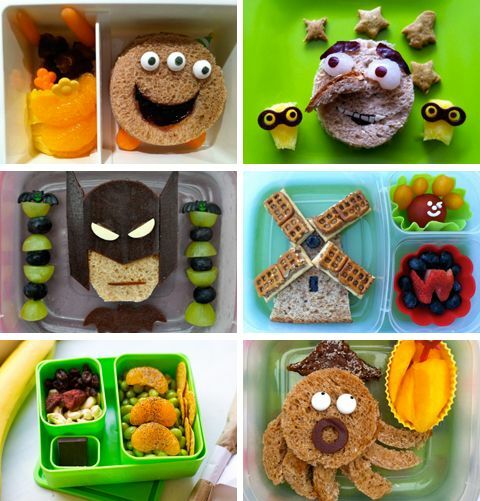 If you’re looking for some inspiration for cute ways to present healthy food, check out our Pinterest Board “Kid Food”. Good luck getting your kids to eat healthy!